14 000 000 rubles - for this amount issued fines specialists Gosadmtekhnadzor Russia for a week. And all this for running in the suburbs excavation violations. Such a substantial sum suggests that the excavation industry is quite important and you can ignore the rules of their conduct is impossible. If you are unsure, it is better to hire specialists. However, it is desirable to see rates for the carrying out of such works. 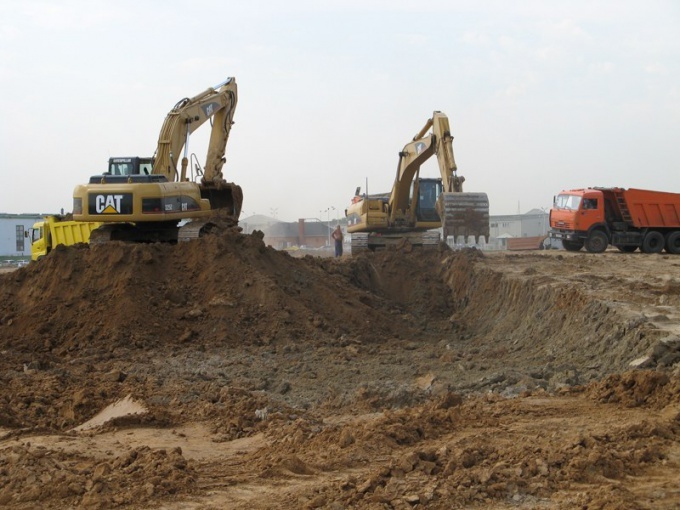 Under excavation work usually understand the whole complex of works, which includes excavation and its movement, removal or stacking in another particular place. Its significance is such works are an essential element of both industrial and hydraulic engineering as well as transport and housing garzhdanskoy construction. Typically, excavation carried out to create engineering structures of soil. Include such dams, otsypnoy roads, trenches, channels, and much more. Often, such work owners trust unskilled crews working in the street. This behavior is not too good and leads in most cases to the problems in the form of missed deadlines, wrong work, and many other troubles. Of course, choosing such teams only in order to save money, as prices are much lower than the official organizations. But experts claim that such work is better not to save, because sometimes it can cost more (especially if all have to redo). The final price of the land depends on how much you will need, will all be carried out manually or using special equipment, as well as of the land, and many other factors. In addition, the pricing depends on the amount of dredging. More important is the relocation of equipment (if it will be used): the closer the land to the place which is the main base of the company, the cheaper work. The export of soil - another expense that must be considered when carrying out works. One of the most common excavation is the excavation. For the most part they are necessary for laying the Foundation. Moreover, the digging can be done manually and with the use of the excavator. It depends on the type and number of storeys of the house. And it just seems that digging a ditch is a simple task. Actually have to deal with the calculation of the total area, and with calculations based on the export of soil, and many other important details. Depth to dig the hole must be equal to a layer of freezing ground in the winter. For Central Russia it is about 1.5 meters. As for the Northern territories, where this figure is, of course, more. Digging of the pit requires special knowledge and skills. In addition, you will have to make a project in which they will be working. As a result, the cost of such work is increasing. And the average is estimated at 60 cents per cubic meter. It is also necessary to add more and the rental of an excavator, which is according to minimal estimates, about 150-200 rubles per hour. And this, if we take into account only the net cost of excavation. If you connect another, and the development of the project, clearing of land, removal of soil, backfilling, etc., the price will be much higher. Experts say that to dig a pit under a small country house with insulation and other necessary procedures will cost about 40-50 thousand rubles. On average, the cost of services in the market is about the same and, if different, then only slightly. As a rule, experts include in its estimate of the works such as: earthworks (from 50 RUB per 1 cubic meter), the alignment areas (50 p. per meter), protection of existing utilities (as a rule, the price is negotiable and depends on the level of occurrence, quality of soil, etc. ), additional work, such as the development of excavation of soil, construction of embankment, drainage (they are estimated at from 60 p per cubic meter). As elsewhere in the market for wholesale discount. For example, if the work will be scheduled on the area from 500 metres cubic, the cost of services will be reduced in each case by 5 p. If the plot even more, the discount can be 10 p.
Doing the work manually is more expensive than his price will be about 400 rubles per cubic meter. Usually this kind of work is carried out in areas where nearby trees, i.e. within the soil lie the roots that are easily damaged by large appliances, where installed communication lines (especially if they are shallow). Manually it is better to dig, if the terrain with bumps and stumps. There is risk not only damage nature, but also to break equipment. By the way, uprooting of stumps is also included in the list of land operations and is valued at 1500 p per share. Felling of trees is also provided and repairers is estimated at between 1,200 for the gun. Also note that some companies initially define the minimum for which they will work. For example, in most cases, it is argued that the minimum order should be around 10,000 p.
The well at the dacha the more expensive of the pit under the house. The cost of digging the earth under it is estimated about 2500 p. per cubic meter. Plus here still need to add the unnecessary removal of soil which will cost you another 1,000 rubles per cubic meter. Preparation of individual project in most cases is estimated at 50 000 R. But it is necessary to think carefully, to refuse it or not. First, this document will allow you to know virtually everything about your site - from soil type to soil density and mixture of species of the earth. Second, the plan will be clearly reflected even the smallest details, like the laying of utilities, the exact dimensions of the trench or other excavated objects, which subsequently will help you to properly arrange and the site, and future buildings in the relevant bodies.